Here you have an E-Flite EFLU3080 2.4Ghz UMX PT-17 BNF Ultra-Micro Electric Airplane !! This plane is 100% Z-foam construction, pre-painted and ready to bind & fly !! It includes Motors, Servos, Rieceiver, Charger, Battery Pack, Owners Manual And Original Box !! These exact Kits sell for $119.99 plus tax or shipping at any hobby dealer and are Well Worth It ~!! These Kits are beautiful and ready to bind & fly !! Simply Open Box, Bind to a 4-8 Channel Spektrum Series DSM2 Or DSMX Transmitter, Charge & Install Battery Pack & You Are In the Air !! Photo's do not even begin to show the beauty of the colors of this plane, it is Fabulous !! Again, please go back and check photo's thoroughly and you will see !! 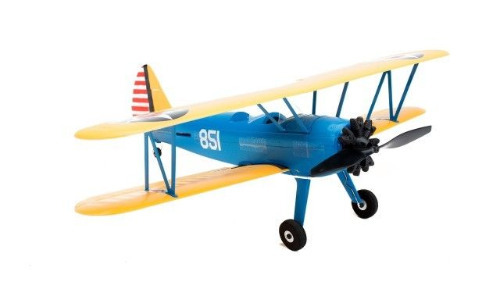 You can't go wrong here when you have this "All New BNF Airplane" with a low Buy It Now Price of only $89.00 , you will get this Very Nice Color pattern for Great Visibility, and if you Buy Now you can receive it in just a "few days" !!! OK, so Thank You For Looking and Please Check My Other "BUY IT NOW OFFERS" For More BNF & RTF Planes, Cars, Trucks, Helicopters, Boats, Motors, Parts, Accessories and Many More Great Deals ! !